As solar power continues to expand, more companies are trying to find ways to cuts costs and be more efficient in the process of providing us with wonderful, clean, renewable energy. One solar company in San Antonio, OCI Solar Power, thought of an idea that leaders there say is sheer genius. They’ve put sheep to work on the grounds of a solar farm on the far northeast side of San Antonio to keep the grass cut. As solar panels soak up plenty of hot Texas sunshine, there’s plenty of landscaping work to do at the Alamo 2 Solar Farm. But instead of people, OCI Solar Power is employing lambscapers. The solar farm isn’t the largest, however it is still difficult for man and mower to tackle, which would increase costs across the board. The company started using sheep three months ago to maintain the grass at the 50-acre site. It’s the first time in Texas this has been done although it’s nothing new in California and Europe. The 4.4-megawatt solar farm where the sheep graze is part of a series of 400-megawatt solar power plants that CPS Energy plans to have completed by 2016. Typically, a megawatt of solar energy can heat and cool as many as 100 homes on a hot summer day. When the temperatures aren’t as dreadfully hot, it can power many more. At the San Antonio plant, which is home to thousands of solar panels, OCI Solar describes its grazing as an experiment that has worked well. The roaming sheep appear to have done their job; the grass reaches no higher than one foot despite recent heavy showers. When you have shrubbery growing over the panels you start losing effectiveness. The sheep have been a very important part in helping this site put out the maximum amount of power that it can. The sheep have been very well behaved. Unlike their equally hungry cousins goats may have done, the sheep have not chewed on cables or jumped on panels. The sole accident thus far came when one devious sheep snuck through a gap in a locked gate. OCI staff members teamed up with a police officer and a local resident to corral the animal within 30 minutes. At least the sheep had a bit of fun. 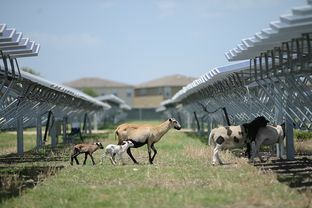 Sheep grazing is not a prevalent practice at solar farms in Texas however it has been used elsewhere, particularly in California and parts of Europe. Hiring a local breeder to bring sheep to a solar system is far less expensive than hiring human groundskeepers, companies say, and easier than trying to operate lawn equipment in tight spaces and around cables. In return the sheep receive fresh water and shelter from the glaring Texas sun beneath the panels. Sharing the land also benefits and supports the local agricultural economy, industry leaders say. While the initial idea of mixing solar power and sheep might seem silly, it has actually proved to be incredibly beneficial to OCI’s farm. The first site was used as a guinea pig. Since the results have been positive, they hope to implement the lambscaping on other farms as well.